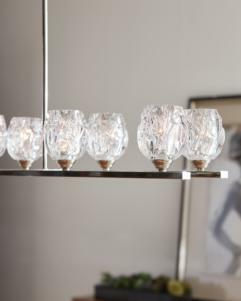 The clear, faceted votive glass shades of the Rubin lighting collection by Feiss serve as the central design element and add a romantic elegance and sparkle to these contemporary interpretations of classic lighting fixtures. A clean, sleek look is achieved with the round and rectangular chandeliers which will be perfect as foyer lighting, living room lighting or dining room lighting. Or a more playful, fanciful statement can be made by clustering pendants together to create a look that’s reminiscent of a floral bouquet featured in a bedroom, luxurious walk-in closet or romantic dining room. This contemporary lighting collection includes a four-light chandelier, six-light chandelier, nine-light chandelier, 10-light linear chandelier and a mini-pendant light. Lamping: (3) Candelabra B10 Torpedo 60w Max.